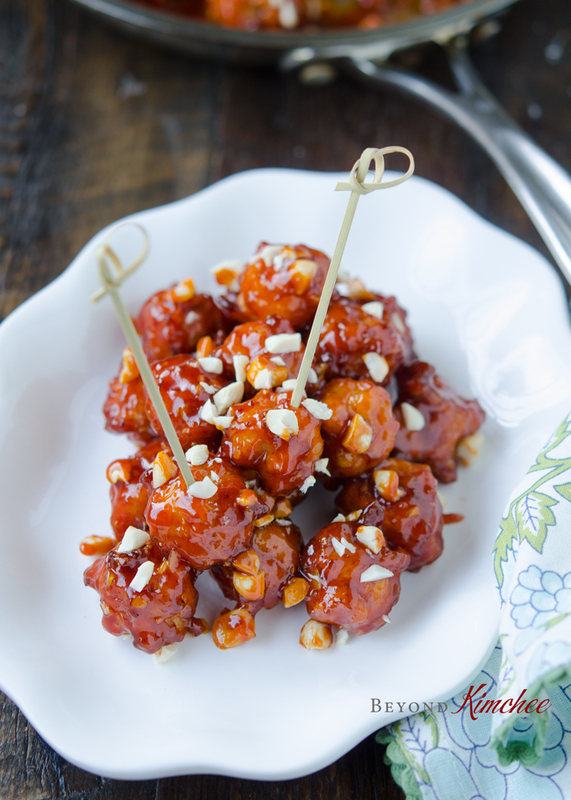 Who wouldn’t enjoy munching on these little sticky spicy chicken nuggets that are crisp, sweet, and tangy? They are a little bit on the spicy side, but not like the kinds that kill your senses. This particular Korean chicken appetizer is called Dak ganjeong (닭강정). It is crispy and slightly spicy Korean chicken nuggets. Yes, they are deep-fried. That makes this chicken so tasty and irresistible. As long as you don’t eat them by the bucketfull, a few pieces will calm your craving and won’t hurt you so badly. As you can tell, they are tiny pieces. I made this crispy Korean chicken nuggets to post in a website called DramaFever. As some of you might already know that DramaFever is hosting major Korean movies and dramas with English subtitle. 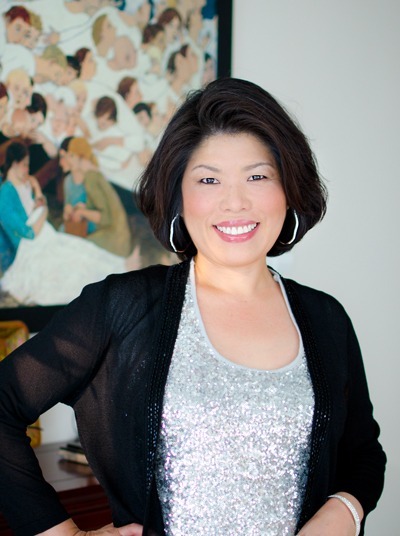 Recently I was invited to write a food column with Korean recipes for their site. I have posted several recipes already and the response was successful. If you would like this Crispy Korean Chicken Nugget recipe, please follow the link and you will see the full tutorial along with the written recipe there. Who know? You might ended up watching some recent hot Korean dramas while browsing their site. 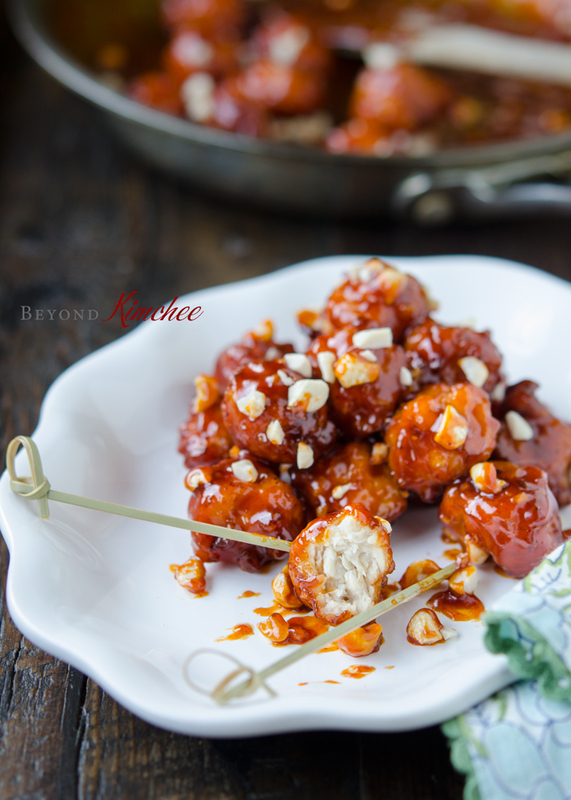 If you happened to like Korean movies, invite your families and friends over Korean movie night and introduce this crispy Korean chicken nuggets to them. This is perfect movie snack, and people will love this if they can handle a little heat. 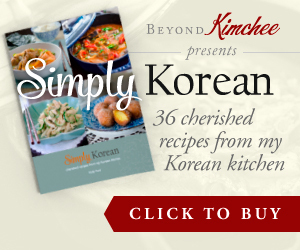 If you have Korean friends, they will think you are the master of Korean cooking. Now, that would be quite a compliment to enjoy, right? Go and grab the recipe before it’s too late! Enjoy! It looks delicious. I can't stand mayonnaise (or sour cream). Can I just omit it, or do I need to sub it with something, like Greek yogurt? You can skip the mayonnaise. And that is how I found your awesome blog! Great! I am glad that you found my blog. Oh man! Check out that glossy sauce!! I can just imagine the sweet, salty, sticky flavour. TOTALLY my kind of food!! I love Korean food! I have never had anything Korean I haven't absolutely love!! Yes, they are truly sticky delicious. I agree with you on Korean food. I myself never met any Korean food that I don't like either. Ha ha ha! These look so saucy and delicious! I really enjoy chicken nuggets (whether they are frozen, from McDonald's, I like them all!) and I think these crispy ones will be better than anything I can buy from a store or eatery. 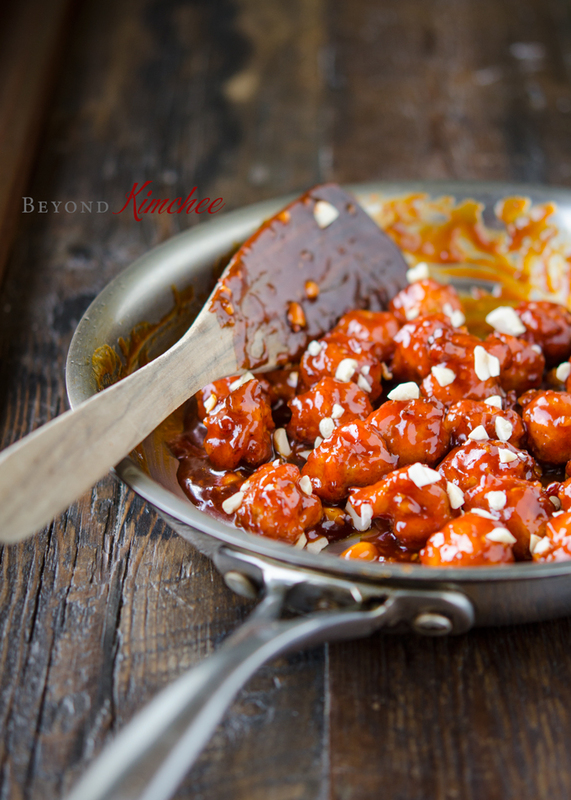 I like that you used gochujang and honey in the sauce ~ what a delicious combination! Can I make this with beef meatballs? The sauce is good enough to coat beef meatballs, too. Be very gentle when you coat them not to break apart. Hi Holly! I love your recipes so much. These korean chicken nuggets are absolutely my favorite food now! I start craving them after a few days! So I had to think of a way to make them into a meal for my partner and I. There is a japanese "fast food" in food courts in New Zealand called Katsubi Donburi where you choose various fresh vegetables, sauces and meat dishes (like teriyaki) to have over rice. I thought this would work very well with these nuggets and I was right! I start with steamed rice seasoned with a little soy sauce and sesame oil then sliced red cabbage and quick steamed broccoli. Top that with a bit of japanese mayonnaise and bbq or chilli sauce and then the delicious sticky nuggets. It's so delicious and we're always very excited for korean chicken nugget night at home! Thank you Holly! Hi Shannon Glad to hear from you that this chicken nuggets are well loved by your family. I like to idea of serving with steamed broccoli and cabbage. That will make a very nice meal. You go girl! Thanks so much for this comment. It does make me happy. Can I grill those chicken balls instead of frying them? Well, they might not hold their shape very well, but you can certainly try. Can someone please tell me how to pronounce the name of this dish? So DramaFever is sadly no more. Is there a way you could post the recipe here on your website?